This 300 year old dock workers cottage is in a conservation area a few yards from the quayside in this quaint and picturesque riverside village. 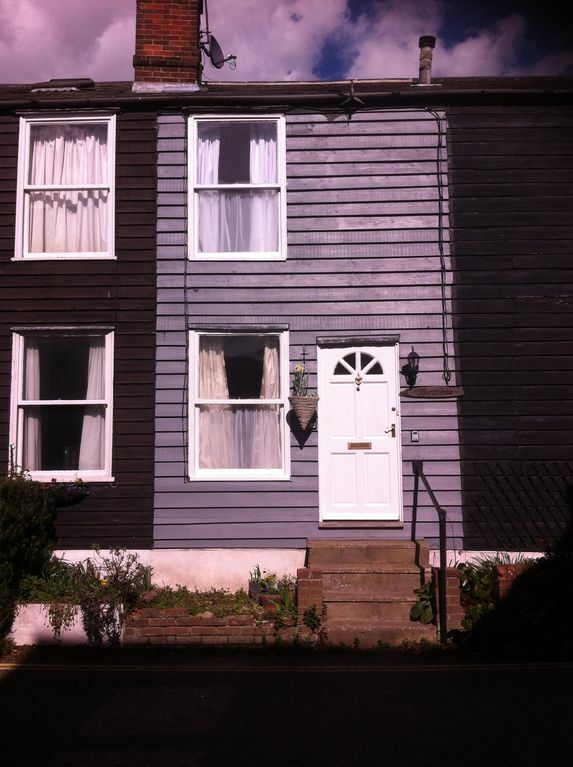 Convenient for London, Colchester, Essex University and the Seaside within minutes from Trains, buses and ferries. Wivenhoe is a surprisingly cosmopolitan area for its size with varied cafes pubs and restaurants and a good supply of live music and the arts. There is a comfortable living room, well equiped kitchen with gas cooker,microwave,fridge, toaster, kettle etc. Attached to the kitchen is a conservatory and enclosed rear garden with seating areas. Upstairs is a double bedroom and a small single bedroom with a 2'6'' bed suitable for a child or will accommodate an adult for a short stay. Please note-There is no clothes hanging facility in the small bedroom apart from a hook and only a small bedside cabinet. The bathroom has an enclosed shower with toilet and basin. There is gas central heating and a real fire in the front room which you may use in colder weather. Some fuel is provided for this purpose for a small charge. The enclosed back garden means its suitable for small children and pets and is a sun trap in warmer weather. I am only 3 miles away and can provide local knowledge, advice on entertainment and places to visit. In particular we are connected to the local music scene and can advise those wishing to access it. Please ask if you have any special requests. My husband and I are recently retired and have 6 adult children and 4 grandchildren. We enjoy circular walks in the local countryside and live music. I have an interest in Art and Poetry and draw myself. We are both from the area and have good knowledge of local facilities so ask us if you have a special interest you want to pursue during your stay. We recently aquired this property as a complete renovation project and it has been hard work. Its now ready to have visitors and I hope you will enjoy its traditional charm as much as we do. It was originally one of 4 timber clad dock workers cottages and the plans we were given show a shared garden area with outside toilets and shared wash house. With modernisation you no longer have to share these facilities but we haven't changed much apart from making it more comfortable. The property is over 300 years old and is located in a conservation area. Its location is very near the waterside and for the size of the property includes a generous sized enclosed walled garden which is a sun trap in hot weather. Wivenhoe is unique in its cosmopolitan feel and local facilities for such a small village. It has 6 pubs several restaurants including two cafes and a co-op, 'one stop' and its own post office and library. Its self contained but very close to Colchester and the University and the village regularly holds literary, film and other events. There is a popular regatta in the Summer. A ferry from Wivenhoe takes you across to Rowhedge and further upstream to Brightlingsea. Additionally, it is possible to get a ferry from Brightlingsea to Mersea Island just 7 or 8 miles from Colchester. Whether you want to visit the sights of London, Colchester, spend time at the seaside, or just chill out in Wivenhoe the location has a lot to offer. Shower toilet and basin -Note there is no bath at this property. Available for lets of over a week. There are long lasting logs at a cost of 1.50 each to be paid as you use them. On street residents parking. Visitors can park free at weekends and a pound a day (owner to arrange) for weekday parking. Parking and pet money to be paid in cash at the property. A day bed/sofa and dining or working area. A dining table and 4 chairs situated in the living room/dining area. A lovely enclosed walled garden which is a suntrap in the spring and summer. Outside seating areas. Colchester zoo the castle Essex University and seasides are nearby and its only an hour from London on the train. We had a great time, loved the cottage. It was cozy and warm when we needed to be and the garden was a lovely place to hangout when the sun shone. Really close to the waterfront and railway. Penny was generous and communicative. Thank you very much for a great holiday. obviously very creaky as with all very old properties but this just added to it's charm . We have just had a brilliant short break and as we used the property as a base it was perfect for the rail connections to nearby seaside towns and the fact that we could take our 2 dogs was a real bonus for us,the welcome pack was really generous and overall we have had an enjoyable time. Very well equipped, warm and clean cottage in good location close to waterfront. Sunny courtyard. Lots of extras included with welcome pack give a feel of being at home immediately. Thanks for your review. Glad you enjoyed the cottage. An lovely little cottage that has gradually been brought up to date which is not an easy task. Lovely "Village" , changed a lot since 1997, Lots of good walks and some nice pubs and shops. Thank you Keith for your review. I’m glad you had a good stay and enjoyed the cottage. A nice clean and well presented cottage. Bed was comfy and plenty of space for 2. Only downside, is parking is a bit hit and miss. Wivenhoe is 3 miles from Essex University and Colchester and both can be reached by a picturesque riverside cyclepath/footpath. There are resteraunts and pubs within minutes of the cottage and the quay is a few metres away where you can sit and enjoy a drink at the Rose and Crown or Fish and chips from the local chippy. Within 15 mins to half an hour you can be at Brightlingsea, the nearest seaside and Colchester Britains oldest recorded town with its own castle, museums, art galleries, arts centre theatre and zoo. Colchester can be easily reached by train or bus and Brightlinsea by a short bus trip. Clacton Walton and Frinton larger sea side towns can be easily reached by train or bus. Pets by arrangement and small fee of £5 per night for additional cleaning. The street has residential parking which is only restricted to residents with permits for 1 hr 7.45-8.45am. If you wish to park at the property during this hour you will need to pay £1 per day extra and supply your car reg in advance. Please note the 2 nd bedroom is small and does not have much storage and no wardrobe. Although it has a full length bed it is 2'6'' wide and is most suitable for a child.The sofa/ day bed in the front room can be used as an alternative at your discretion. The property has a shower but no bath.